An Election Day tradition continued yesterday, as approximately 300 female voters made a pilgrimage to the grave of suffragette Susan B. Anthony to pay tribute to the role she and others played in winning the right to vote for America’s women. 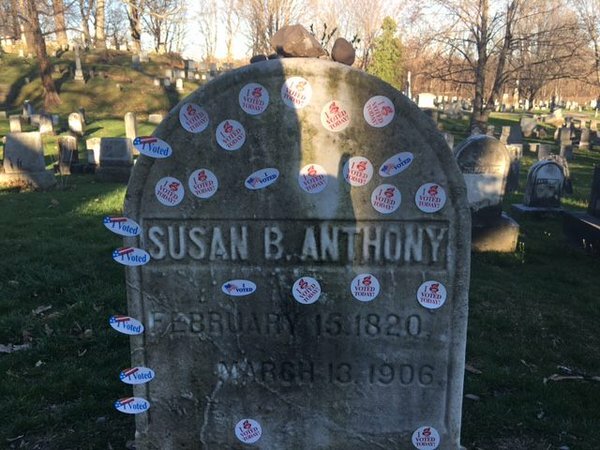 Anthony’s headstone in Mount Hope Cemetery in Rochester, N.Y., was plastered with “I Voted” stickers in a year where voting took on a deeper meaning for many women. “I’m voting for the first woman president. As a woman, I can vote because of the sacrifices she made,” said Gillian Paris of Brighton, N.Y. Some of those visiting Anthony’s grave were dressed in white, a color symbolic of the suffrage movement. Others wept at the significance of Anthony’s fight in an election that almost gave America its first woman president. Many brought their daughters. Anthony devoted a lifetime to fighting for women’s rights. Though she died 14 years before women were finally given the vote, her impact as an agitator, activist, and leader in the fight for equality retains a mighty resonance today. Initially focused on improving property rights for married women, she organized petitions and presented them to the New York State Senate Judiciary Committee in 1855. The response of the all-male committee to Anthony’s campaign was that women, in fact, received more preferential treatment than men, citing as examples that they were given the best seats in carriages and the choice of which side of the bed to sleep on. Later, recognizing the value of civil disobedience in achieving social reform, she and several fellow suffragettes, were arrested for illegally voting in the 1872 presidential election.